Sudatel has always made a point of voicing its ethical principles, just as it has also made clear its commitment to reliable working practices. For 17 years now, since 1999, it has contributed between $2 and $4 million (US) annually to supporting vulnerable sections of the Sudanese population (figures sourced from the Company) by partnering with institutions spanning those critical areas of health, education and youth development. Health-wise, the company has apportioned funds to the building of hospitals and clinics in cities and rural areas alike, as well as to the purchasing of modern medical equipment for their efficient functioning. Projects of this nature have reached numbers in the 500s, some 150 of which were in the more difficult regions of western Sudan. Examples abound but to mention a few, Sudatel’s support has reached Khartoum Teaching Hospital’s Ear, Nose and Mouth Unit, Khartoum Dental Teaching Hospital and Rural Ambulance Services. The company has also injected much needed cash into national campaigns to eradicate Malaria. There is a high rate of malaria-related mortality in Sudan although the national malaria control programme, with the support of the WHO, reduced the number of malaria cases from more than four million in 2000 to less than one million in 2010. In the same time period, the number of deaths due to malaria reduced by 75% (Figures from WHO website). A provision that goes arm-in-arm with good health-care is clean water, and investment in good water services are always key for sustainability. Sudatel has far from neglected this side of affairs, and it is one which continues to be a challenge for Africa as a whole. The company has started over 500 projects involving the construction of water plants, networks, reservoirs and water pumps. These basic-needs projects contribute to the stability of, largely, rural areas where they are most needed. The company has even spread its expert involvement in water and irrigation-related projects to Senegal. When it comes to education, Sudatel has aided both the restructuring and the building-from-scratch of many schools, and simultaneously provided the equipment for some 45 college laboratories. Crucially, science teachers and laboratory technicians have been trained in the labs, whilst elsewhere female university students have been sponsored and more than 800 mosques been established in schools within the framework of “A Mosque for Each School” project. Tens of thousands of desks have been supplied to students over the past few years (the “Students’ Seating Project”) and a mind-boggling 13-million books handed out. In a small village in the Darfur region, one primary school has been fully kitted out by Sudatel. But the list of materials that Sudatel has provided for educational establishments does not end there. The company has, in addition, supported the Education, Science and Arts Faculties at the University of Khartoum by installing 75 computers and preparations are underway to provide equipment and devices for a radio and TV studio at the media department of Omdurman Islamic University. Helpful facilities, such as movement equipment, have also been provided for people with disabilities. A number of drinking foundations have been implemented in universities and schools, too. Young people represent 60% of the population in Sudan. In 2013 Sudatel branched its CSR activities into the important area of youth entrepreneurship, and started sponsoring a television show called Mashrouy (meaning “My Project”, in Arabic). In format, it is often compared to the UK’s “Dragon’s Den” or “The Apprentice”. The launch of Mashrouy was made possible via collaboration with several institutions of renown, notably The British Embassy, The British Council and The Sudanese Association of Young Businessmen. Adverts to join the show saw 2,500 young Sudanese entrepreneurs sign up, from whom the six most outstanding were chosen to present their business ideas to a panel of distinguished judges. 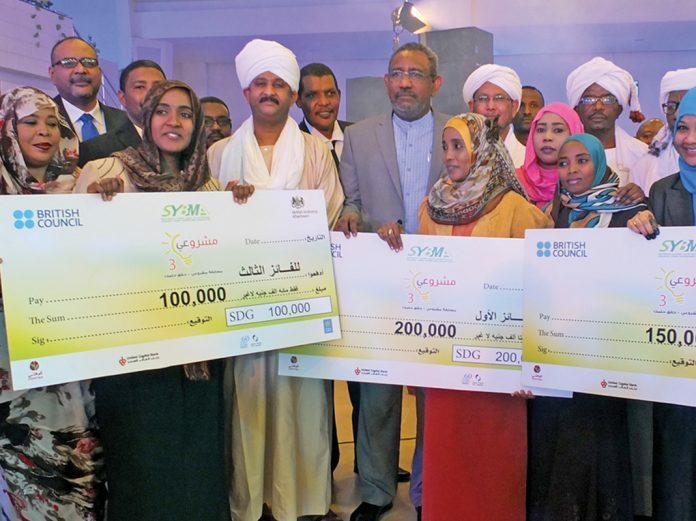 Three winners were chosen by Sudan’s watching public, and each among the trio won prize money, as well as a trip to London where they met and spoke with British entrepreneurs. Whilst not all could win, 600 of the early-stage participants received business start-up training in which Sudatel staff were involved. In the inaugural “Mashrouy”, Sudatel’s CEO stretched to giving prize money to the 4th and 5th runners up too, and in the series the following year those who ended up in the same positions were invited to observe Sudatel’s operations in Senegal and Mauritania, accompanied by a high-level executive from the Group. In addition to these surprise supplementary awards revealed by Sudatel, the CEO declared that the company would support any final-stage project on the program that was related to the telecom sector. The UK’s youth entrepreneurial scene is becoming increasingly integrated into the program, year upon year. The series continues to seek to change the mind-set of Sudanese youth aged between 18 and 40, by demonstrating the importance that entrepreneurship can have on a nation’s economic development, and by inspiring young people to create their own employment and provide opportunities for others, thereby contributing to economic prosperity in Sudan. At a time of national economic uncertainty and in a country where starting a new business is no easy ride, the show has awakened the imagination of the Sudanese youth. It has raised awareness of the importance of entrepreneurship and the very real role it can play in changing lives of those who dare. In the shows, contestants have come up with an array of ideas such as using weeds from the River Nile as biofuel, manufacturing Sudan’s first French fries and recycling rubbish form the streets to make jewellery in the style of ancient Sudanese empresses. Sudatel’s youth development projects address the major issue of high numbers of orphans in the country too. An estimated 10% of Sudan’s children are orphans and many children live on the streets. Refugee camps abound and tend to lack electricity and good access to water, and are far from disease-free. It is an area that deeply requires investment. Sudatel has a sponsorship programme dedicated to the cause, and it supports 1,500 such vulnerable individuals each month by working with 23 nation-wide volunteering bodies. The rationale behind giving backing to national organizations is so that the orphans concerned can have the best chance of being rehabilitated directly into society. The most well-meaning CSR efforts should of course start at home; in other words, a company ought to be acting in a responsible way in its own day-to-day operations, before extending efforts to any exterior environment it may have the power to improve. Sudatel knows this only too well and internally it has improved the living standards of its workers and their families. The company has greatly taken into account all of its stakeholders too: society, government, stockholders, subscribers, workers, importers and civil society organizations. Overall, Sudatel has left few stones unturned in its efforts to adhere to the principles of transparency and fair governance as an integral part of its responsibility as a leading company in Sudan. Overall, Sudatel’s CSR activities are impressive. The company was a founding member of the local Global Compact Network in Sudan, a United Nations initiative in which companies are called upon to align their strategies with universal principles on human rights and social good. Sudatel was also recently selected to represent not only Sudan but also Africa in the global Business for Peace (B4P) Steering Committee.